Today, the Half Cent Coin remembers when Hezekiah Niles began the Niles’ Weekly Register on September 7, 1811. Niles’ Register was first published by Hezekiah Niles on Saturday, Sept. 7, 1811, at $5 per year. It was in some respects the best newspaper of its day, and is still a valuable mine of historical facts. William Ogden Niles became associated with his father in 1827, and on the latter’s retirement, Sept. 3, 1836, he became sole manager of the Register. On the 2d of September, 1837, he removed his publication-office to Washington, D. C., and published his weekly there, under the name of Niles’ National Register. Hezekiah Niles, the founder of the Register, died at Wilmington, Del., on April 2, 1839, in the sixty-third year of his age. His son Ogden died in Philadelphia on the 8th of July, 1858, being stricken down with paralysis and apoplexy. At the time of his death he held an official position in the Pension Bureau at Washington, although he was nearly all his life connected with the press. On the 4th of May, 1839, the office of the Register was removed to Baltimore, and on the 19th of October Mrs. Sally Ann Niles, the widow of Hezekiah Niles, sold the paper to Jeremiah Hughes, who continued to publish it until Feb. 26, 1848, when it ceased to exist. Niles’ National Register was resumed in Philadelphia in July, 1849, under the charge of George Beatty, but it was not a success. THE EDITOR TO THE PUBLIC. Custom forms a “common law”—it is second nature. A first number, without an address would outrage the law: as we propose to demean ourselves in the most peaceable manner, we submit to the law, and offer our thanks for the very liberal patronage our work has received in many parts of the Union. The current of sentiment is evidently in our favor (we say our, for printers and kings have an unquestionable right, by the aforesaid law, to make much of themselves)—the unusual number of subscribers already obtained, convinces the editor that his opinion was just as to the want of a work such as the WEEKLY REGISTER is intended to be; but while so great success flatters his pride and provokes his exertion, it also alarms his fears, lest, in despite of all he can do, the public expectation may be disappointed, though to guard against this, he has made some extensive as well as expensive preparations. In arranging his matter for the first number, the editor has compared himself to a young shopkeeper (just commencing business) suddenly thrust into an immense warehouse of most valuable goods.— His eye is pleased with a great variety of articles, and his judgment convinced they would, in due season, answer his customers—but he cannot purchase all; and, flurried by the quantities before him, perhaps, selects some things that, for the present, he had better leave untouched, though ultimately and unquestionably good. As time tempers his judgment, and experience, the great teacher, enlightens his views, he enters the same warehouse without palpitation, and deliberately lays off such articles as are adapted to the wants of his neighbors. We hope thus to meet the wishes of our numerous friends; and trust that, by a single number, they will not attempt to judge the merits of our work— as its utility (if any it shall have) will not become so manifest before several are joined together. It is in our power to remove the first cause of apprehension— but the latter depends on the public as well as ourselves. The first shall be removed, as the REGISTER proceeds—it is not intended for electioneering purposes, of course party politics will be avoided; yet, by the insertion of original and selected essays, on both sides of great national questions, we shall feel it our duty to preserve a history of the feelings of the times on men and things. If we have discovered the rock on which our predecessors have shipwrecked, the second cause of apprehension may, perhaps, be removed. We attribute the general failure of periodical publications to too great a dependence on voluntary contributions from persons without an interest in the work, whose spirit flags when novelty ceases to charm. Though we intend to pay the most grateful attention to communications of this kind, and hereby respectfully solicit them, still we have made no calculation upon them, except so far as they relate to the arts and sciences—to manufactures—and to agriculture, in which, from the public patriotism, we hope for considerable aid. We may sometimes do our work roughly, but for our own sakes (that is, the editor and those associated with him) will attend to it diligently; and by close application strive to render it useful. This number is to be regarded as a fair sample of the paper and manner in which the work will be uniformly printed. When the present secretaries of State and of the Treasury shall lay their respective reports before Congress on the population, manufactures, &c. of the United States, they shall be given to our readers as a single number, however voluminous they may be—and to the report of the former shall be prefixed the state of population as ascertained by the census of 1790 and 1800 and such other facts as can be collected relating to the same subject at more distant periods; so that, by comparison, the rising importance of our country may be duty esteemed. Mr. John Quincy Adams’ letter to Harrison Gray Otis, Esq. as containing an admirable history of the causes which produced the embargo, and rendered necessary some other important acts of the government, shall have place in the Register. Mr. Pickering’s political essays shall also be recorded in an extra number or numbers; likewise Mr. Robert Smith’s address, with the “Review “ of it, published in the National Intelligencer. These things are particularised merely to skew our general design. In the original prospectus we promised only twenty six numbers to a volume—it is more than probable they will exceed thirty perhaps amount to thirty-two. For this extra expense, if incurred, we shall seek indemnification in the hope of pleasing the public, and so increase our patronage; with which we will try to keep pace. PROPOSALS for publishing by subscription, in the city of Baltimore, on a plan entirely new, a periodical work, to be entitled THE WEEKLY REGISTER. This work shall be published every Saturday at noon—printed on a sheet of fine super royal paper, with a non-pariel or brevier type, and contain 16 pages octavo, at five dollars per annum, payable at the expiration of six months from the commencement of the publication, and annually thereafter. But subscribers, non-residents of the cities or towns in which the editor shall have an agent, must always pay in advance after the first six months above stated. Twenty six numbers shall constitute a volume, making two large volumes in a year. It shall be delivered in the city and precincts of Baltimore on the day of publication—and be carefully packed up and sent to subscribers residing at a distance by the first mail thereafter leaving this Post office, whithersoever it may be directed. But after the publication of the said thirteen numbers, all subscriptions will be considered as for one year, unless expressly agreed to the contrary; and as continued thereafter if not otherwise ordered. On discontinuance arrearages must always be paid. To give an idea of the quantity of matter the Proposed work will contain, it will be proper to observe, that each number of the WEEKLY REGISTER will have about one fourth more reading than is compressed in the largest of our news papers outside and inside. Advertisements will not be admitted. 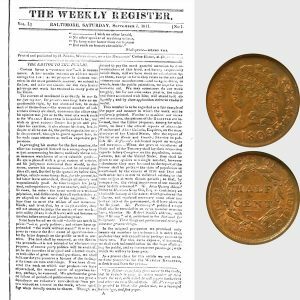 The Half Cent Coin shows with an image of the initial page of the first Niles’ Weekly Register of September 7, 1811.